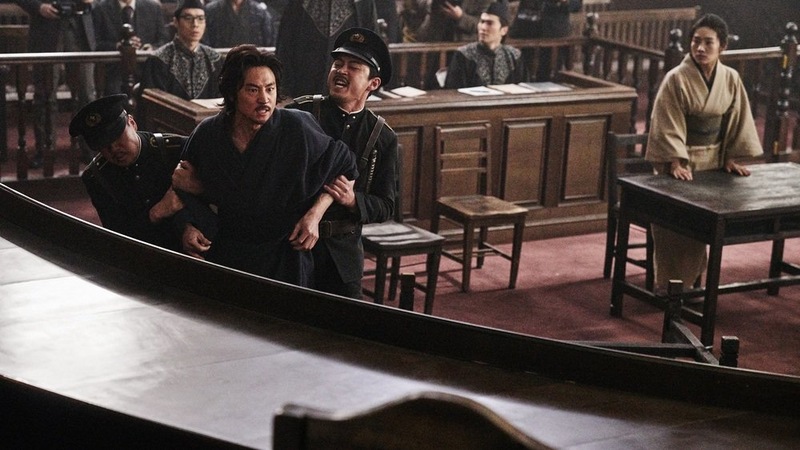 For the past few years, Korean cinema has been swamped with various period films, in which the country’s turbulent history has been amalgamating fiction, action and frequently monotonous anti-Japanese propaganda. Although successful within the domestic market, it is rare for historical dramas to achieve an overseas 5-star rating; and one such film is Lee Joon-ik’s Anarchist from Colony. Lee might be an award-winning film director, but this period feature did not surpass his previous works, such as 2005 King and the Clown, 2015 The Throne or 2016 Dongju: The Portrait of a Poet; in the contrary, the story about Park Yeol, a self-proclaimed Korean independence activist, lacks in depth not only in its narrative, but also in terms of character development. Tokyo, 1920s. Park Yoel (Lee Jee-hoon) makes his living pulling a rickshaw around the capital; he is also a secret activist who wants to cause trouble to the Japanese authorities. Under the influence of social upheaval, caused by the 1923 Great Kantō earthquake, the government massacres many Koreans, groundlessly blaming them for the crimes. A couple of days after the quake, Park Yeol and his fellow rebels are detained. While the other rebellionists are released, Park is accused of high treason for alleged assassination attempt on Prince Hirohito. Kaneko Fumiko (Choi Hee-seo), the anarchist’s lover, a Japanese, strong-minded young lady, who bravely fights against her homeland’s authorities, also gets arrested. After a while, both admit to having planned disturbance in Tokyo, but without hard evidence, they end up in court, laughing at the ineffectiveness of the government as well as the Empire. Just when you would think that an engaging plot will be introduced, Lee Joon-ik serves us with a rather unusual drama instead. Anarchist from Colony tries to depict the young people’s dreams of freedom, but it all gets overshadowed by inadequate humour and the liaison between Park and Fumiko. One would have expected a portrait of a serious revolution with a depiction of the protagonists’ dedication to the cause, but despite its historical background, Anarchist from Colony turned into a courthouse drama with capricious moments and a Harlequin romance. It might not be a standard anti-Japanese propaganda film either, as there is a minimum acknowledgement of the full extent of the crimes committed by the Japanese in that period – their side is presented in an almost harmless way, with some fairly positive characters. Lee Jee-hun is average in the role of Park, and gets easily pushed into the shadows by the debuting actress Choi Hee Seo; she not only goes through to audience like a lightning through the clouds, but shows off her linguistic talents (Japanese) as well. Undoubtedly, the character of Fumiko is more appealing than the titular anarchist. Unfortunately, the film is too long and definitely in need of better editing. Lee Joon-ik might have had a good intention while writing the story of Park Yeol, but his latest work turned out to be an average and unexciting production about a not-widely-known historical figure from the Japanese occupation period. Maggie Gogler is a freelance film producer, production manager and she also works with children. She has a passion for Korean and World Cinema as well as music and arts. Maggie has been interested in cinema since she was 15 and discovered love for Korean films in 2004 when she saw Kim Ki Duk’s The Isle. She supports British and Asian independent film-making and enjoys producing creative and interesting projects. Maggie is the co-founder of View of the Arts and its sister website View of Korean Cinema. Sanja Struna is a freelance translator, occasional writer and a perpetual dreamer. Film is her first and longest-lasting love; since writing is her second, she saw the light a couple of years ago, let the two join hands and entered the field of film journalism. She has honed her knowledge through various film festivals which she either worked for or frequented. She is currently harboring a fascination with all things Korean and condones losing sleep if that means she can watch a good Korean film or drama. Sanja is the editor of View of the Arts and co-founder of View of Korean Cinema.